The Times article was saying that this Capezio boot had become one of the popular styles in the 1961 collections, and any reference to a knee-length fashion boot from the 1950s (a time when boots, although present, were invariably ankle length) was worth chasing up. But the more I looked, the more puzzling things became. For starters, the reference to “ballet boots” (a term that today is usually applied to a form of fetishwear that holds the foot permanently en pointe) is not coincidental. Capezio, as a company, was and is best known as a manufacturer of dance shoes. There is a Canadian shoe store called Capezio, but it only dates back to the late 1970s. Google Capezio and 1960s and you get references to Capezio shoes as a fashion item, but not their relationship to either the dance wear company or the mysterious boots. 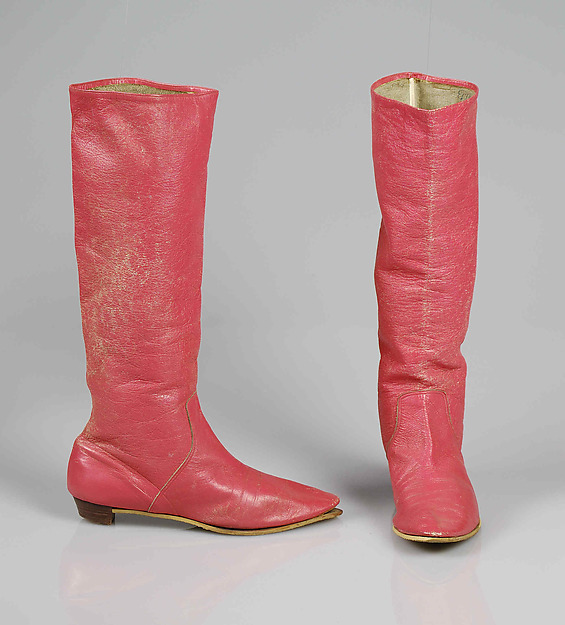 Then, lo and behold, I found a pair in the collections of the Met, dating back to 1961. And yes, it looks like these are the ones referenced in the Times article, and it looks like the company is the same as the ballet shoe manufacturer. So at one level, my question is answered. Except what about those ones from 1957? Were they originally intended for dance wear and subsequently co-opted for fashion, like the famous alligator-skin thigh boots Roger Vivier designed for Saint Laurent’s couture collection in 1963? Or were they an early, Beth Levine-type foray into more aggressively promoting boots as a fashion item? So now I have to go do more research. Sigh. High-Style Boots Rise to the Knee: Fall Versions Will Be an Important Part of Many Costumes. New York Times, May 1961.